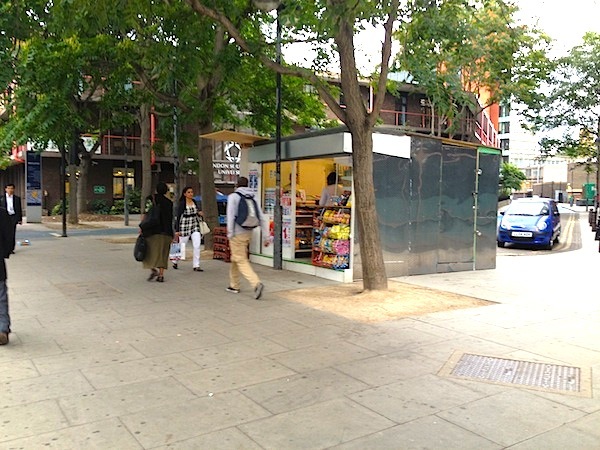 Has anyone else noticed the little shop that has popped up on London Road, next to the bus stops and Southbank Uni? I find it hard to believe this actually got planning permission! I saw them constructing something last week, is it open now? What are they selling? 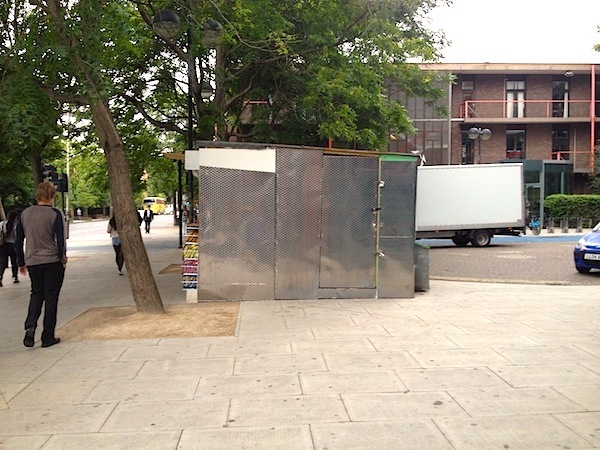 It could be a food stall, I think I saw what looks like a cooling unit. Good footfall for them but not practical for the crowds waiting or running to catch a bus. I think it looks horrible just when London Road had been cleaned it up of railings and other street furniture and recycling bins smelling of wee. 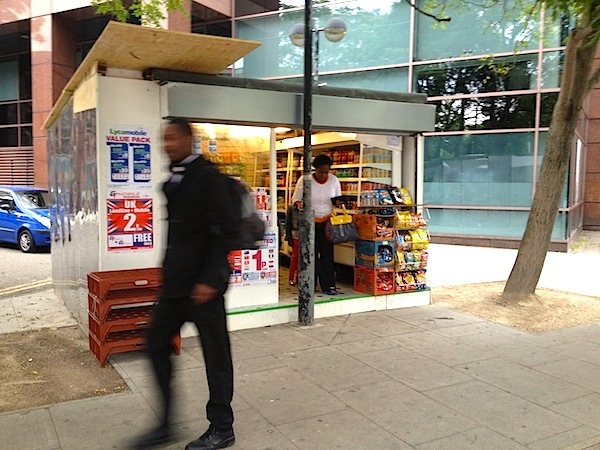 It is set up as a proper little corner shop, albeit it is in a shed. It is similar to some of those near the Tai Won Mein (?) place at the Elephant. Do they have planning permission and how do they get their electric? I noticed it a few days ago. As it looks ramshackle and worn I thought I was mistaken and simply never had noticed it before. I seem to remember seeing a few refrigerators in there. I'll have a proper look next time I cycle past. But it seems odd something uninspiring like this is granted permission given that the whole area is meant to be regenerated. Surely something much more interesting could have been put there like for example the bar that is in a shipping container on the Queen Elizabeth Hall roof, or even the shipping containers outside LCC. I noticed it yesterday and wondered if the kiosk had been relocated/displaced from somewhere else - possibly due to the Olympics and Paralympics. It did seem to have some sort of licence document on display for street trading or similar, but I didn't look closely. I wonder who controls that bit of pavement? TfL? 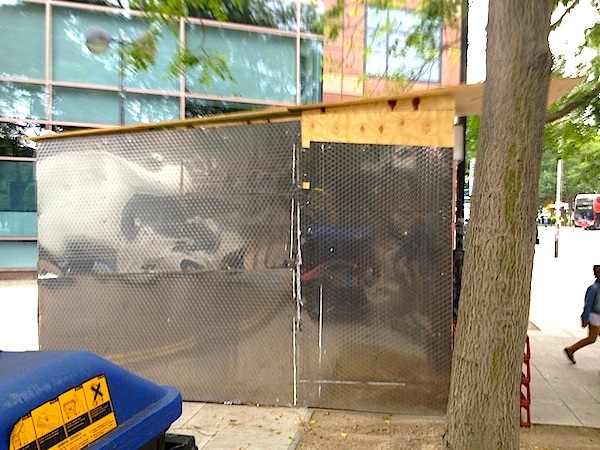 I see they have a street trading license, but don't understand how the building could have got planning permission? At a time when we're trying to rejuvinate the area this sort of thing makes it look like a shanty town. Passed by this shack on my way back from work today and took a few pics. It's a sorry looking structure, one that would not be out of place in a 3rd World favela. 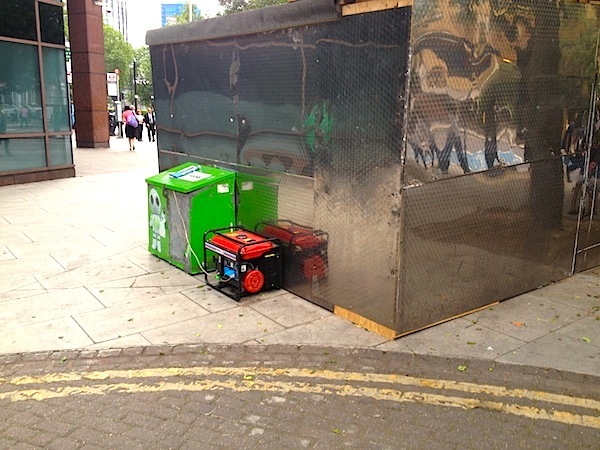 Power is provided by a rather loud and unsafe looking generator placed at the rear of the shack. If planning permission was actually granted to this structure, I believe a serious error of judgement was made by the Council. Has anyone spoken to the council? I bet they're squatting (the shop I mean).